Fender’s new line of effects impresses for each pedal’s utilitarian functionality, distinct sounds, useful and innovative new features and their exceptionally affordable prices. Since the early Fifties, Fender has remained a music industry leader in the worlds of guitars, basses and amplifiers with their expansive ranges of top-notch instruments and amps. However, one significantly related category that Fender hasn’t pursued quite as extensively over the last six or seven decades is effect pedals. Through my most thorough research, I was able to come up with only 15 stomp boxes (not including utility tools, such as volume and expression pedals or tuners) that Fender released prior to 2018, and almost half of those were announced over the last 10 years. However, this year, Fender has finally plunged headlong into the wild and wonderful world of stomp box effects. And to date the company has announced nine new pedals, almost doubling the number of effects the company has ever offered in one fell swoop. The line currently consists of bread-and-butter effects, including overdrive, two distortion pedals, fuzz, boost, delay, reverb, compression and a buffer. No wacky modulators, filters, pitch shifters or even wah or tremolo yet, but hopefully those effects are in the works. 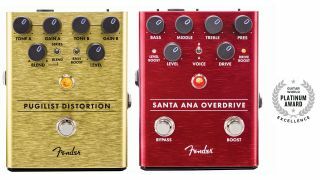 We're taking a look at four of the first of Fender’s new pedals to hit the market: Santa Ana Overdrive, Pugilist Distortion, Mirror Image Delay and Marine Layer Reverb. FEATURES Most companies that enter the stomp box game merely tend to imitate, basically offering yet another choice instead of something truly new. Fender takes a very different approach, introducing several features so cool that we're surprised no one thought of them before and that they haven’t become more common. I particularly like the magnetic battery access compartment at the front of the pedal, which is simply genius. The LEDs that illuminate the knob settings look awesome, but even better is the ability to turn them on or off with the flick of a switch on the rear panel. The Mirror Image Delay and Marine Layer Reverb pedals have a Dry Kill on/off switch. Setting this function “on” sends only the “wet” signal to the pedal’s output, which is ideal for a parallel loop setup where a dry signal always comes through the amp and the wet, processed signal is blended in separately for maximum clarity. The Santa Ana Overdrive also includes a true bypass/buffer switch and a boost function switch for selecting level or gain boost. The Pugilist Distortion has a cool dual-distortion circuit design, with each circuit providing individual tone and gain controls. A Blend knob allows users to blend the circuits together to create rich, layered distortion. The Santa Ana Overdrive has three-band EQ, plus presence and two different voice modes. The Mirror Image Delay provides digital, analog or tape delay type settings, dotted 1/8th note on/off and two variations of each delay type, as well as controls for delay time, modulation depth and rate, feedback and level. The Marine Layer Reverb has hall, room and special reverb type settings also with two variations each, a filter on/off switch and pre-delay, reverb time, damping and level controls. PERFORMANCE While the effect categories that Fender selected for its new line are certainly bare-bone staples, each of the pedals has its own distinct personality that make them worth consideration by players who may already own dozens of stomp boxes. The Pugilist Distortion excels at producing wicked high-gain distortion effects with stacks of harmonically complex layers that are really easy to dial in to perfection. The Santa Ana Overdrive produces fat lead tones as well as distinctive hard rock rhythm crunch, and the switchable boost function is great for punching a solo above the mix (level setting) or adding extra creamy compression and sustain (gain setting). The Mirror Image Delay delivers rich, musical-sounding echo and slap-back effects with impressive clarity and “edgy” warmth, particularly in the analog and tape settings. The modulation section also allows those who prefer more creative (i.e. weird) textures to dial in some unusual effects. The Marine Layer Reverb's hall and room reverbs are exceptional, with smooth tails and realistic ambience, while the “special” effects, which includes an octave reverb layer and modulated reverb, also provide creative sustenance for those who prefer something a little different (and without spending several hundred dollars to do so). ● Innovative new features include magnetized battery compartment doors and LED control illumination that can be turned on or off and dry kill on/off switch for the delay and reverb pedals. ● The Pugilist Distortion features two individually voiced distortion circuits with separate tone and gain controls that can be blended for more complex, harmonically rich textures. LCD “scribble strips” above six of the eight footswitches depict effect block names and make it easy to adjust parameters for each effect or even view all of an effect’s parameters at once. ● The Santa Ana Overdrive allows users to set the boost function for level boost (for increasing volume level) or gain boost (for increasing saturation and compression). ● The Marine Layer Reverb and Mirror Image Delay each provide three different effect types with two variations for a total of six distinct reverb or delay effects. ● THE BOTTOM LINE Fender’s new line of effects impresses for each pedal’s utilitarian functionality, distinct sounds, useful and innovative new features (particularly the magnetized battery compartment door) and most of all for their exceptionally affordable prices.